Beth White is a licensed attorney admitted to practice in the State of New Jersey, Federal District Court of New Jersey and before the Supreme Court of the United States. She joined the firm in 2018 as an associate. 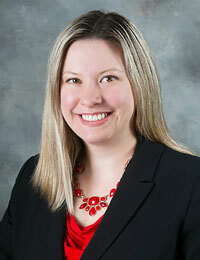 Ms. White is a graduate of Rowan University and Widener University School of Law. Primarily representing clients in Workers’ Compensation and Social Security Disability matters, Ms. White also represents clients in cases for Personal Injury, Defamation, Harassment, LAD and Civil Rights Violations, Appeals from Administrative Decisions, and many other causes of action. Ms. White also represents clients in Criminal and Municipal Offenses, including DWI and all traffic offenses. In her transactional practice, Ms. White represents clients in Estate Matters, preparing Wills, Living Wills and Powers of Attorney, as well as guardianship actions. In Real Estate matters, Ms. White prepares and reviews Deeds for Real Estate and handles Real Estate Closings. Beth White was raised in Bergen County, NJ, but has called Cumberland County home for more than a decade. She is a Past President of the Cumberland County Bar Association and continues to chair its Annual Children’s Holiday Party for the kids involved with Big Brothers, Big Sisters and The Salvation Army. She is also a member of the New Jersey State Bar Association. To schedule a consultation with Beth White, call (856) 825-0700. Clients who have retained her services may contact Beth White by email. For purposes of confidentiality, legal questions cannot be answered over the telephone or by e-mail, unless you are an existing client. For Workers' Compensation and Social Security Disability matters, as well as Personal Injury matters, the initial consultation is free. For Criminal, Municipal Court and Traffic Offenses the initial consultation fee is $100.00 which will be credited toward the retainer fee (a flat fee) should the client choose to have Mrs. White represent them. For other matters, a typical consultation is also $125.00, with a separate retainer for representation quoted at the consultation, otherwise my hourly rate is $275. Early morning and evening appointments are available, as well as house calls, if necessary. All consultations fees are payable at the time of your consultation.